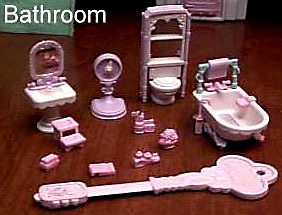 Description: This is a set of bathroom furniture and accessories designed to be used with #5166 Magic Key Mansion or other Precious Places® sets. This set includes a decorative sink, tub, and a toilet and shelf unit. The set also includes several tiny accessory pieces that are so small that many were lost the first day that the set was opened. The remaining few fall into the "hard-to-find" catagory. This set was designed for children ages 5 years and older. FPT6917 - White bath tub with scalloped edges around the top outside edge. The tub is rounded on one end and flat on the other end. It has a rectangular hole in the center of the bottom with 2 short pegs on the underside. The top of the flat end has 3 holes: 2 on the sides to add the towel rack, and a hole with a rectangular hole in the middle to add the faucet and knobs. Measures 2-3/16" long, 1-5/16" wide, 5/8" high. FPT6918 - White H-shaped bath tub base that the FPT6917 tub fits on top of. The base has a raised rectangular shape in the center with 5 anti-skid lines on each end and a small heart and scroll designs in the center. This raised rectangle fits in the rectangular hole in the bottom of the tub. The base has 4 short ornamental "arms", one on each corner, with a tiny round ball on the top of each arm. Two sides of the base have a raised curved ornamental design with a heart and sunburst design in the center of the outside. The bottom of the base has 4 small round ball "legs", under each "arm". Marked "©1989 FISHER-PRICE, MACAO" on the bottom. Measures 1-11/16" long, 1-5/16" wide, 5/16" high. *See "Variations" below. FPT6919 - Pink rectangular faucet base that attaches to the FPT6917 base. The base has a rectangular faucet in the center, and 2 knobs (one on each side of the faucet). Each knob has a triangular-shaped handle on top that is pointed outward. The bottom side of the faucet base has a raised round peg with a raised square on 2 sides of the circle. Measures 3/4" long, 3/8" wide, 3/8" high. FPT6920 - Light purple C-shaped "pipe" towel rack that has 2 vertical pipes with a small hook on the side, and a connected pipe across the top between them. The 2 pipes that stick up have little pegs on the end that fit into holes on the FPT6917 tub. Measures 7/8" high, 1-1/4" wide, 1/8" thick. *See "Variations" below. FPT6923 - White rectangular single bowl sink with scalloped edges along the bottom edge of the countertop. The countertop has a semicircular recessed sink bowl, and a wide rectangular hole behind the sink bowl to attach the sink mirror. The bottom of the sink bowl has a long peg that attaches to the FPT6924 sink pedestal. Measures 1-1/16" long, 13/16" wide, 3/4" tall. FPT6924 - Round white tiered sink pedestal base with ornamental layers along the bottom. The pedestal has 5 recessed diameter tiers with the largest tier on the bottom and the smallest on top. The bottom of the pedestal is hollow. Measures 3/4" diameter on bottom, 3/16" diameter on top. FPT6925 - White sink mirror with an attached faucet under the mirror, and hot and cold water knobs on the lower outer edges. The mirror has a reflective surface that resembles a real mirror. The top of the mirror has a raised heart shape, and the bottom (above faucet) has a raised heart shape. The bottom edge of the mirror/faucet has a rectangular slot that fits into the rectangular hole on the FPT6923 sink. Measures 1-7/16" long, 1" wide, 5-16" deep. *See "Variations" below. FPT6922 - White toilet unit with a tall towel rack with 2 shelves above the tank. The toilet has a molded lid on top and a molded heart and sunburst design on the front. The tank has a molded handle on the left side. The top of the towel rack has a heart shape in the middle and scrolled designs on the sides. Marked "©1989 FISHER-PRICE, MACAO" on the back. Measures 2-1/2" tall, 1" wide, 3/4" deep. FPT16874 - Tall light purple decorative frame that fits around the FPT6922 toilet/towel rack unit. The frame fits over the top and fits snugly against the sides. The inside walls have 4 C-chaped clamps that attach to the back sides of the toilet/towel rack unit. The outer sides and top have raised decorative scrolled and raised heart designs. Measures 2-5/8" tall (6-1/6" long overall), 1-1/4" wide, 3/8" deep. FPT6926 - Aqua scales with a U-shaped stand on the bottom and a round dial on top. The dial has a pink movable arrow that can be moved with a Precious Places® magnetic key. The back of the scales has a pink disk with a small round off-centered magnet that makes the arrow move when the disk is moved. The dial is connected to the base stand via short pedestal that has a heart shape near the top and 2 unside down J-shaped under the heart. Marked "©1989 FISHER-PRICE, MACAO" on the bottom. Measures 1-1/2" tall, 15/16" wide, 7/8" deep. *See "Variations" below. FPT6927 - Pink 2-step stool with a heart imprint in the center of each step (small heart on bottom step). The front, sides, and back of the stool have solid support walls with a rounded recess in the center of the bottom edge. Measures 3/4" long, 1/2" wide, 7/16" high. FPT6921 - Aqua hard plastic towel with 4 lines and "fringe" across the bottom. The towel has a c-shaped clamp on the back. Measures 1/2" wide, 1/2" high, 3/16" deep. *See "Variations" below. FPT6929 - Tiny pink soap dish that has a C-shaped clamp on the side that attaches to the side of the FPT6917 bath tub. The soap dish has a lot of bubbles and a bar of soap with a heart imprint in the center. Measures 7/16" long, 1/4" wide, 3/16" high. FPT6928 - Pink brush with a J-shaped handle hooks over the side of the FPT6917 bath tub. The brush has a rectangular brush head with long simulated bristles. Measures 1" long, 5-/16" wide, 1/4" deep. FPT6931 - Round pink cup with a tube of toothpaste and 2 toothbrushes sticking out of the top. The cup is beside a small square box of tissue with a raised heart on the side of the box, and a piece of tissue on top. Measures 1/2" long, 1/4" wide, 9/16" tall. FPT6932 - Three pink bottles attached together side by side. The center bottle has a raised heart shape on the side. The tallest bottle has a lid with ribbed sides, and a recessed rectangular shape on the side. The smallest bottle is round with a half-heart shaped knob on the top. Measures 5/8" long, 1/4" wide, 3/8" tall. FPT6933 - Pink something? perhaps a nail brush(?) that has rectangular center with a recessed rectangular piece on 2 sides for "bristles". Measures 7/16" long, 1/4" wide, 5/16" high. FPT6930 - Pink oval-shaped vase with a flower arrangement on top with molded flowers and leaves. The bottom of the vase is oval-shaped. Measures 1/2" wide, 1/2" tall, 5/16" deep. FPT16876 - Light blue oval-shaped fabric rug with "frilled" edges. The rug has a yellow circle and pink star design on one side. *Note: This rug is pictured in the Fisher-Price dealer catalogue, but we are not sure if it was ever included in the sets sold in stores. FPT6934 - Purple magnetic key with a magnet on one end and a handle on the other end. The handle is marked "Precious Places®" on one side and has a paper litho on the other side, unknown decription of litho. (Litho may be missing). Marked "©'88 F-P MACAO". Measures 5-1/2" long, 1-5/8" wide, 1/4" thick. FPT16870 - Light purple H-shaped bath tub base that the FPT6917 tub fits on top of. The base has a raised rectangular shape in the center with 5 anti-skid lines on each end and a small heart and scroll designs in the center. This raised rectangle fits in the rectangular hole in the bottom of the tub. The base has 4 short ornamental "arms", one on each corner, with a tiny round ball on the top of each arm. Two sides of the base have a raised curved ornamental design with a heart and sunburst design in the center of the outside. The bottom of the base has 4 small round ball "legs", under each "arm". Marked "©1989 FISHER-PRICE, MACAO" on the bottom. Measures 1-11/16" long, 1-5/16" wide, 5/16" high. FPT16872 - Aqua C-shaped "pipe" towel rack that has 2 vertical pipes with a small hook on the side, and a connected pipe across the top between them. The 2 pipes that stick up have little pegs on the end that fit into holes on the FPT6917 tub. Measures 7/8" high, 1-1/4" wide, 1/8" thick. FPT16873 - Light purple sink mirror with an attached faucet under the mirror, and hot and cold water knobs on the lower outer edges. The mirror has a reflective surface that resembles a real mirror. The top of the mirror has a raised heart shape, and the bottom (above faucet) has a raised heart shape. The bottom edge of the mirror/faucet has a rectangular slot that fits into the rectangular hole on the FPT6923 sink. Measures 1-7/16" long, 1" wide, 5-16" deep. FPT16875 - Light purple scales with a U-shaped stand on the bottom and a round dial on top. The dial has a white movable arrow that can be moved with a Precious Places® magnetic key. The back of the scales has a pink disk with a small round off-centered magnet that makes the arrow move when the disk is moved. The dial is connected to the base stand via short pedestal that has a heart shape near the top and 2 unside down J-shaped under the heart. Marked "©1989 FISHER-PRICE, MACAO" on the bottom. Measures 1-1/2" tall, 15/16" wide, 7/8" deep. FPT17068 - Light purple hard plastic towel with 4 lines and "fringe" across the bottom. The towel has a c-shaped clamp on the back. Measures 1/2" wide, 1/2" high, 3/16" deep. FP5174BOX1989 (Box ONLY) - Sold in 8" long, 11" high, 2-1/2" box. WFL: 07-AF-26-4-A.